Scott Johnson's handmade glass centerpiece brings floral loveliness to the table in any season. "Earth laughs in flowers," said Ralph Waldo Emerson, and artists have tried to capture their beauty in every form since art began. Scott Johnson's handmade glass flowers are remarkable specimens of the botanical genre. They have a spectacular radiance when the sun passes through their translucent petals. Even on a gloomy day, room light will find and enhance these many-colored, cheerful lovelies. Designed as a table centerpiece, the piece resembles a window box when placed near (but not in!) a window. For birthdays, thank-you's, and anybody who loves flowers (green thumb or not), this gorgeous never-fade bouquet will express your never-fade affection. Handmade in Arizona. Visit our blog for a chat with Scott on finding his passion and more. Born and raised in Salt Lake City, Utah, Scott Johnson was introduced to the artist's life as a child, as he worked with and learned from his father, a sculptor. His first job, at the age of 12, was working in his dad's bronze foundry. Scott was fascinated, watching the molten bronze being poured into glowing hot molds. Throughout high school, he assisted master craftsmen. After years of working with bronze and ceramic, Scott switched to glass and metal. He and his wife, Shawn, now create together in their Arizona studio. "I love it when people are excited to own work I have created," he says. Glass Flower by Scott Johnson is stunning! 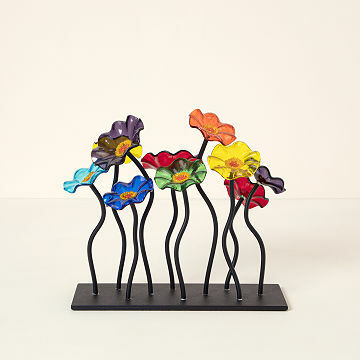 This floral sculpture is one of a kind, very colorful and makes you happy! The best purchase ever. should have bought it the first time I saw it, but you only had the full size one. The smaller version is perfect for my space! Wish I had it years ago to look at! Thanks for carrying so many beautiful and unusual things! This amazing piece of art now lives on our dining room table and was a focal point for the Christmas conversation. Beautifully made. Simple, bursting with color, and a focal point for any room in which it sits. I got this gift from my boys to their Nana, who goes above and beyond for them. We wanted to add a little brightness in her home to remind her of all the brightness she adds to our lives. Absolutely beautiful! A great piece to display anywhere in your home. I have purchased several artsy items with Uncommon Goods through the years; as gifts and for me, and have never been disappointed. I have a large bay window over my kitchen sink and these flowers are a perfect addition to it! If the came in different colours I would buy another to place next to our walk in tub !